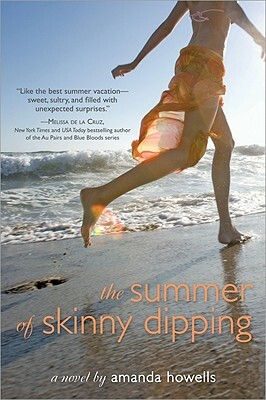 The Summer of Skinny Dipping by Amanda Howells. Grades 8 and up. Sourcebooks Fire, June 2010. Review copy provided by publisher. Mia Gordon is excited for this summer. Her family's finally going back to the Hamptons where Mia's eager to reconnect with her cousin Corinne - the two used to be close, but lately Corinne's not returning her texts. When Mia arrives at her cousin's house, she's surprised to see that Corinne's changed. She's no longer the adventurous companion that Mia remembers. Now Corinne's a party girl, hanging with the right crowd, and Mia feels completely left out. Until she meets Simon, a boy spending the summer at one of the houses next door. At first Mia's not impressed, but the more time she spends with Simon, the more she likes him. But then everything changes forever, making this a summer that Mia will never forget. Guys, I have to admit that I didn't finish this one. I just wasn't that into it and I put it down after about 100 pages. My problem was that I didn't connect with Mia and the story was just taking too long to get where it was going. I had no patience for Mia's problems, which seemed to be the same problems featured in so many other YA novels. Now, while I didn't make it to the end, I did read some spoilers, so I'm aware that the ending is not what you might expect from your typical summer coming-of-age story. But even the promise of plot twists wasn't enough to make me want to finish the book. So, if it sounds like something you'd like, pick up The Summer of Skinny Dipping and give it a try. It's on shelves now!